This experiment demonstrates how DrDAQ can be used to investigate how height effects the velocity of a free falling object. 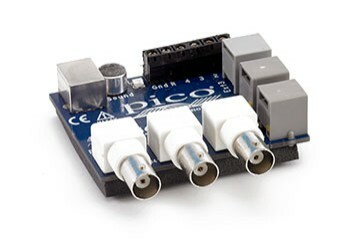 This experiment is very simple, and with PicoScope enables the data to be collected rapidly. The experiment aims to identify and prove existing theories on speed and distance. A stand or clamp to hold the light gate. The idea is to drop a card of known length through the light gate and calculate the speed from the waveform collected in PicoScope. The card needs to be black so that the signal recorded in PicoScope is sharp due to the light beam being interrupted cleanly. It is also necessary to fix two blobs of Blu-Tack to the card to give it some ballast in order for the card to fall straight. The output from the Lascells light gate is fed directly into the voltage input and ground of the DrDAQ, from within PicoScope it is immediately possible to see how blocking the light gate effects the voltage levels. PicoScope is set up to trigger upon the change in voltage from the light gate, 1000 mV. A pre-trigger is added to show the effect the card has on the light gate in better detail. Where the length is a constant (10 cm) and the time will vary, depending on the time taken for the card to pass through the light gate. This experiment clearly shows the relationship between acceleration and height fallen. It also demonstrates that the higher the card falls from the greater the final velocity when it passes through the light gate. From the graph it is possible to predict the maximum speed that the card is likely to fall at from the curve of the graph.